I opened up my Uncommon Goods catalog a few days ago to find myself staring right at the Face Mug. It’s a neat mug that has a compartment at the bottom to hold cookies or other things that you might like to much with your coffee, much like the Dunk Mug that I’ve seen before. The difference is that the Face Mug has a much more interesting, if slightly creepy, look about it. 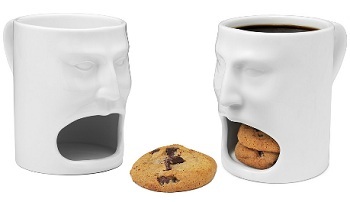 The gaping mouth of the mug seems to ask you to “FEED ME!” with cookies and other goodies. Fortunately, you don’t have to stare into the “face” of the mug while you’re drinking your coffee and can simply enjoy the convenience of having a handy cookie holder. Also, if you take one to work, you can be pretty sure that it won’t disappear from the break room because it is so distinctive!